(Screenshot) Church photos of its temple garments, which faithful members wear beneath their clothes. 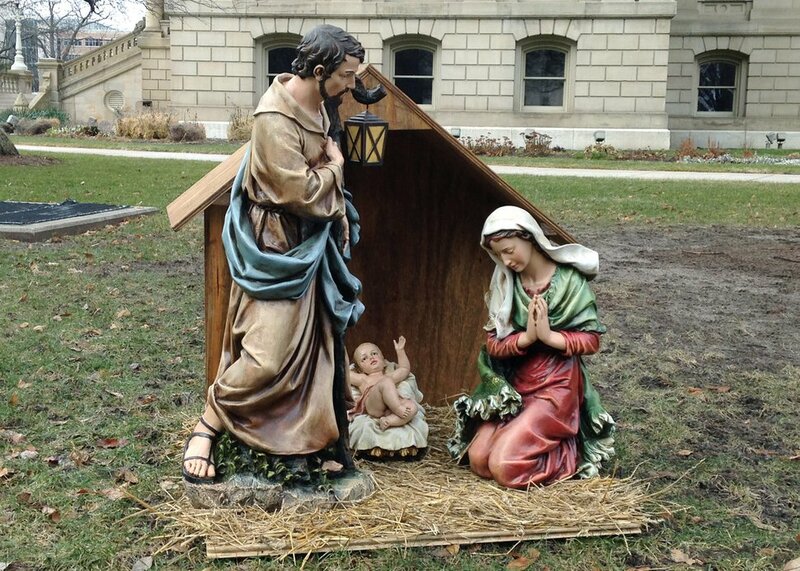 (AP Photo/David Eggert) A Nativity scene is displayed on the Statehouse grounds in Lansing, Mich., Friday, Dec. 19, 2014. In Christian homes around the world this holiday season, families have dusted off their Nativity sets and carefully arranged the pieces in their living rooms. There are wise men, shepherds, barnyard animals, Joseph, perhaps an angel, all paying homage to the baby Jesus. But what about the one woman in every Nativity: Mary. Where does the mother of the Lord fit in Latter-day Saint theology and the wider Christian world? Cristina Rosetti, a doctoral candidate in religious studies at the University of California at Riverside and an expert on the intersection of Mormonism and spirit communication, examines that question and more. A convert to Catholicism, Rosetti, who is a also an archivist at Sunstone and a former Mormon studies fellow at the University of Utah, explains the prominent part Mary plays in Catholic worship and her more-subdued role in Latter-day Saint teachings — along with the doctrine of Heavenly Mother — and how all of this affects women’s places in the world of faith. (Screenshot) The church has posted a video and photos explaining these robes worn by faithful members inside Latter-day Saint temples. The church is drawing back the curtain once again to explain — in short YouTube videos — its temple ceremonies and the underwear devout members wear. One video, running less than two minutes, explains the temple endowment, an ordinance members participate in that includes ritual re-enactments of the creation, Adam and Eve’s expulsion from the Garden of Eden and humankind’s mortal journey and ultimate return to God’s presence. The video, which has logged nearly 40,000 views, then shows the white robes, white caps and green aprons members wear during the endowment. This video has logged more than 32,000 views. In 2015, the church posted photos and a different video about temple garments. Another new YouTube video, with more than 12,000 views, discusses the Latter-day Saint practice of performing baptisms for the dead. Members find names of departed ancestors and then do vicarious baptisms for those souls. A proxy baptism doesn't mean that person automatically becomes a Latter-day Saint in heaven. Mormonism holds that those who have passed on can choose to accept or reject this ordinance. Other new videos about Latter-day Saint temples are also available. 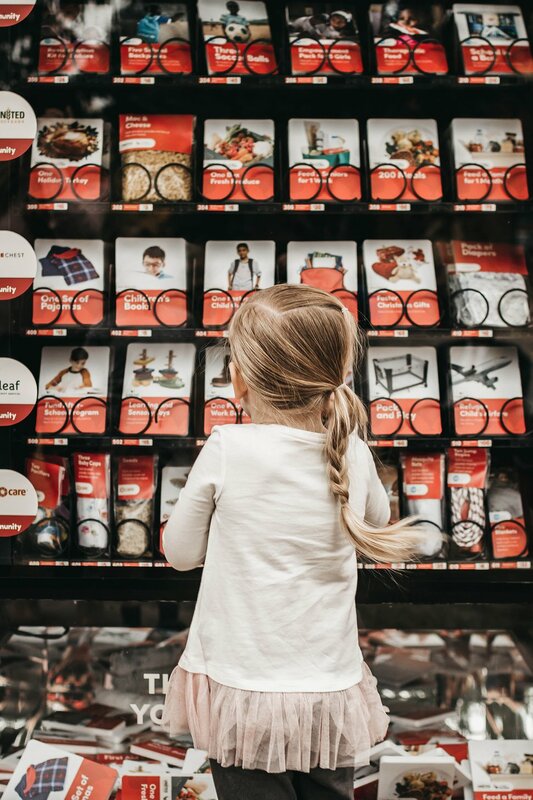 (Courtesy photo | The Church of Jesus Christ of Latter-day Saints) A young girl looks at the selections in a "Light the World" giving machine in December 2018. Those “giving machines” for the church’s Light the World initiative — now in its third year — have racked up more than 52,000 contributions worth more than $1.3 million to charities. These vending machines — located on Salt Lake City’s Temple Square and in New York; Gilbert, Ariz.; London; and Manila, Philippines — allow people to buy and donate predesignated items such as livestock/animals, water filters and eyeglasses. They will remain up through December. (Courtesy Photo of The Church of Jesus Christ of Latter-day Saints) Priesthood-holding Latter-day Saint boys in Africa prepare to pass the sacrament. If you think those 12-year-old boys passing the sacrament look awfully young, hold onto your hymnals. Starting in January, that sacred duty may be undertaken by 11-year-olds. Boys also will move up to “teacher” quorums in the Aaronic Priesthood in January of the year they turn 14 and become “priests” the year they turn 16. In short, that means there can be 11-year-old deacons, 13-year-old teachers and 15-year-old priests. The same goes for girls. They will advance from the children’s Primary to Beehives in the Young Women program at the start of the year they turn 12 and progress the same way to Mia Maids and Laurels, moving up in January of the year they turn 14 and 16, respectively. Such changes are hardly unprecedented. Before 1877, for instance, some boys as young as 8 were ordained. (Courtesy photo | The Church of Jesus Christ of Latter-day Saints) Oakland Temple. Come June, the Bay Area will again have a Latter-day Saint temple. The Oakland Temple, closed since February for renovation, will be rededicated June 16, the church announced in a news release, after an open house from May 11 through June 1. 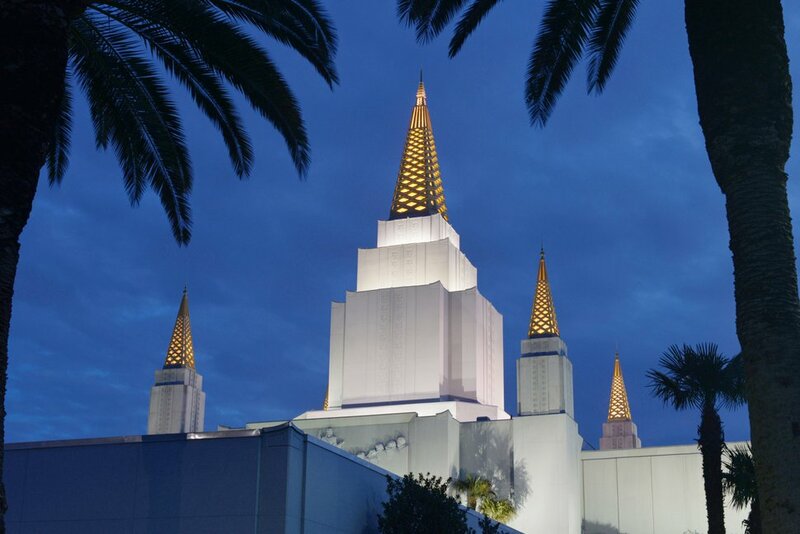 Church President David O. McKay dedicated the original Oakland edifice, the faith’s second temple in California after the one in Los Angeles, in 1964. When it comes back on line, it will be the Golden State’s seventh temple, with plans for an eighth in Yuba City. 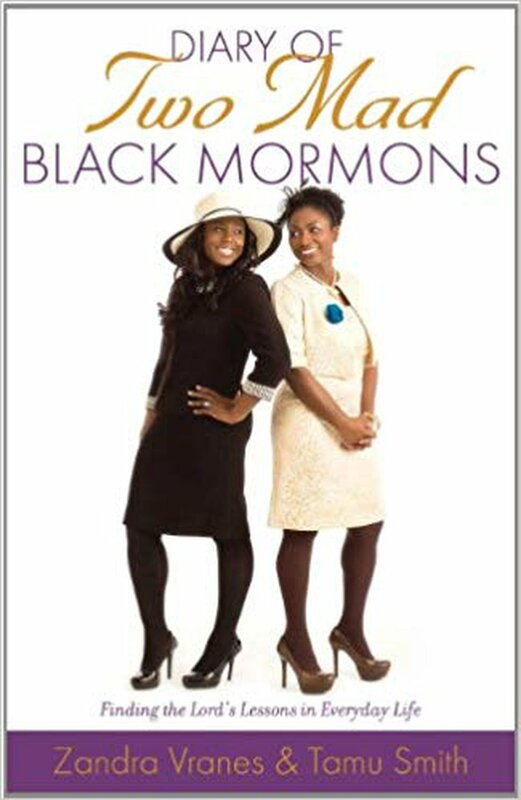 "Diary of Two Mad Black Mormons" is getting a new name. Deseret Book will be seeing fewer Mormon titles. No, it isn’t abandoning books about the faith; it’s just phasing out those that have the words “Mormon” or “LDS” on their covers. “We are committed to following the guidelines” spelled out by President Russell M. Nelson, said Laurel Day, Deseret Book’s vice president for product and branding, and excising the use of “Mormon” and “LDS” as nicknames for the church and its members. The move will impact not just Deseret Book volumes but also other publishers who rely on these church-owned stores to help sell their Latter-day Saint works as well. 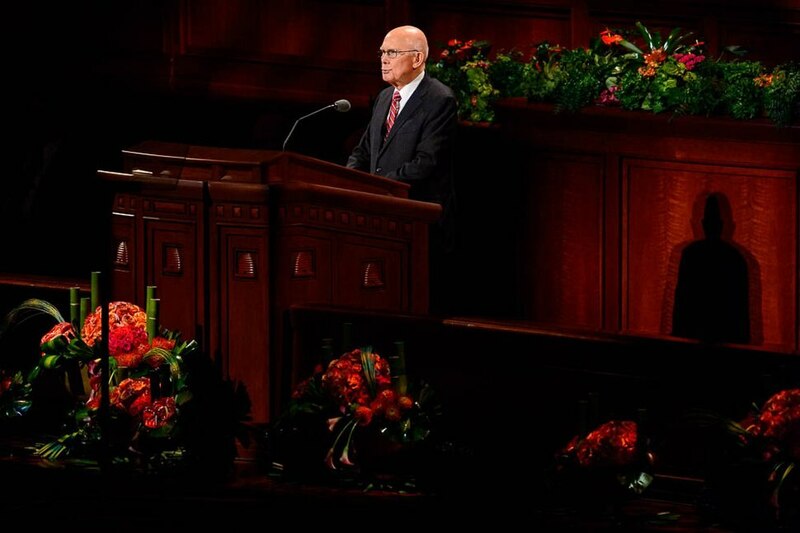 (Trent Nelson | The Salt Lake Tribune) President Dallin H. Oaks speaks at the General Conference of The Church of Jesus Christ of Latter-day Saints in Salt Lake City, Saturday, Oct. 6, 2018. Turns out, such edits or corrections are fairly common. Scholars, however, worry when such changes are made without noting that fact. Read the story about this practice.